The dentist may have told you to go and brush your teeth three times a day but they probably also advised to pair it with regular flossing. We all know how beneficial flossing can be when it comes to one’s oral health and yet sticking to it and making it a habit continues to be a struggle for many adults. Unfortunately, flossing your teeth can be very time consuming. Plus, it is not exactly as convenient to do as brushing. If you simply do not like the idea of traditional flossing, you might just want to consider water flossing. The awesome thing about flossing with water, aside from it being a very cool technology to tinker with, is that you can encourage the whole family to join in a healthy oral habit with you. If you have kids, it will be much easier to convince them to add it into their bedtime routine because it is just very easy to do. Convinced yet? Well, you might just want to start doing some shopping on the best water flossers for your family. Be sure to check out the different features that they bring and particularly look into the range in water pressure that it can deliver. You would want it to be gentle enough to deal with your kiddo’s teeth but also strong enough to deal with yours. The right setting will be able to remove all those hard to reach plaque and tartar, which usually cannot be removed with brushing alone or with regular dental floss. When it comes to the best water flossers available in the market, there is only one brand name to trust: Waterpik. Not only is it listed as the number one bestseller in the power dental flossers category in Amazon, it has also been awarded by the American Dental Association (ADA) – the first product in its class to do so! But why would you add the Waterpik Aquarius into your home? Are electric toothbrushes not enough for the job? The thing is that while toothbrushes can help clean the teeth, there are certain areas in between as well as near the gum line that it cannot reach. And, because kids and even some adults are too lazy to use the regular dental floss, using a water flosser is the next best thing to getting one’s oral health in tip-top shape. This flosser from Waterpik makes use of a combination of dental water jet as well as pulsations to help remove bacteria and debris that are found in between the teeth and near the gum line. We also love that the controls for the water flow are located right in the handle so you can easily turn the equipment on and off without reaching out for other controls and making a mess. Aside from helping remove plaque build up (up to 99%) in between teeth, it is also the best solution to removing any food that gets stuck around implants and braces. It has been found to help improve one’s gum health when used around implants by up to twice when compared to using string floss – or up to thrice when used around braces. What else is there to take note of this product? Well, it comes with 10 pressure settings so you can make it higher or lower depending on your level of comfort. It also has a reservoir capacity of up to 90 seconds of flossing and the package itself comes with seven tips. Cool, right? The pricing is not so bad either considering what you can get out of this product. And, despite it being only limited for use in the North American region, we still think that it deserves to be placed at the top spot. There are only three steps to get your gums and teeth cleaner, brighter and healthier: fill in the water in the reservoir tank, install the tips and trun the water flosser on. Whether you have normal teeth or have to deal with implants, crowns or braces, this product is the perfect companion to help remove and prevent the buildup of tartar and plaque. Why should you consider getting this dental flosser from H2ofloss? While it has fewer pressure settings compared to the Waterpik water flosser (only five: low to high plus one pause setting compared to Waterpik’s 10 pressure setting levels), it is still able to fulfill its task quite well. It comes with pulsating water action with different levels so you can choose which one you are most comfortable with. This can help thoroughly remove bacteria, debris, tartar and plaque as well as massage the gums to keep them healthy and strong. But, is it any better than the Waterpik? In some ways, it is. For example, it comes with an 800 ml water reservoir tank which means that you can go flossing your teeth and gums for up to 150 seconds before having to refill the water. Of course, you can keep the water clean and dust free with the help of the water reservoir cover. The package also comes with a few more tips compared to the Waterpik. There are 12 different tips that can be used for all sorts of purposes: 4 jet tips, 2 periodontal tips, 2 orthodontic tips, 2 tongue cleaning tips and 1 nasal tip each to produce a water spray and a water column. Cool, right? The side of the water flosser has a place to store the tips – you can put in up to 7 tips by inserting them into the plastic slot. However, if you remove the plastic slot, you can put in up to 20 tips inside. That means everyone in the family can store water flosser tips of their own. While it seems that this unit is a bit more superior compared to the Waterpik, it did come with some quality issues that other users have complained about. As such, we have to place this at the second spot. Are you constantly on the go – and also constantly worried about your oral health not being in tip-top shape because you cannot bring all your tools with you? Perhaps you can bring around your electric toothbrush but what about your ever reliable dental water flosser? Well, thank goodness Panasonic has a portable version so you can still reach dirt and debris in between your teeth and near the gum line even if you have to do it inside your hotel room. This water flosser is a lot smaller than the regular kind so you would have to expect that its reservoir tank is a lot smaller (165 ml compared to nearly 1000 ml for the biggest here in our list). However, it is very easy to fill – all you have to do is open the cap in its blue water reservoir, fill it, close it then you are good to go. It will not allow you to go flossing as long as the other flossers in this list but you can still thoroughly clean your teeth and gums before having to fill it with water again. This portable device also does not have as many pressure settings as the normal sized ones. It has a dual pulse system that should be enough to make your mouth feel clean and fresh. You can enjoy a high speed pulse for normal, everyday cleaning as well as a gentler low speed pulse for those who have sensitive gums. Children may also use this flosser using the low speed option. This unit only comes with one nozzle head but you can purchase more nozzles separately and swap it out just like you would an electric toothbrush. Parents (and non-parents) who are constantly out and about will also love that this water flosser is very easy to pack. The collapsible design that it comes in allows it to fit easily into bags and luggage of different shapes and sizes. It is also battery operated so you can use it just about anywhere (not just in the bathroom of your hotel room), just as long as you have access to clean water. You will only need to change the two AA batteries about twice or thrice a year, depending on frequency of use. Most importantly, it is very easy to clean up since it is 100% waterproof. Just bring it under running water, wash it and rinse it. Do not forget to dry it with a clean cloth before placing it back in your bag. We love its portability but would definitely want to get more power – so we are placing it at the middle of our list. Nearly every irrigator water flosser work just about the same: it cleans in between teeth and near the gum line through the use of pulsating water that comes out of the tips. But why would anyone want to get this particular unit from Nicefeel? Better yet, why is it a Parents Need HQ recommended product? Let’s start with the things that are basically the same with the other products – but is not. First up, this particular machine comes with 10 pressure settings, with the highest being at 125 PSI or around 1,600 pulses per minute. It sounds a lot (a bit more than the others listed here) but it is actually the range that provides a comfortable experience for most users. Another huge plus that we like is the oversized capacity that its water reservoir has. At 1000ml, it means that you will have a bit more time for flossing and cleaning before you have to go and refill the tank with water. 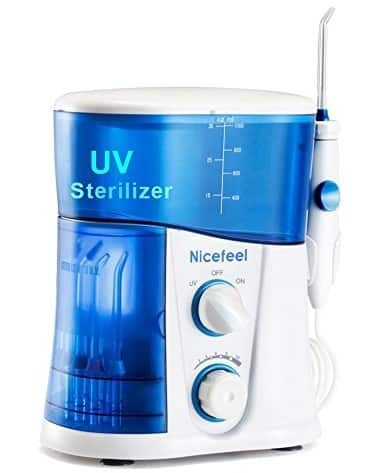 Best of all, this irrigator water flosser is equipped with UV disinfection technology which allows it to clean the most essential parts before you use it. The unit itself has a place for storing the tips, which is also equipped with UV light. You only need 15 minutes of your time each day to get the tips cleaned – you can have it done while you are in the shower or while you are preparing and eating breakfast. There is also no need to worry about being exposed to UV light as the door comes with dull polish to help protect the skin and eyes from exposure. In case you or someone else accidentally opens the door before the 15-minute cleanup time, the UV sterilizer will automatically disconnect so everyone stays safe. The unit is also waterproof so you can use it as you normally would even if it is entirely wet. We would have placed this at the top of our list but there have been many customer complaints about it leaking (ours didn’t though) so we will have to rank it fourth. Another effective way to deep clean your teeth as well as in the gum line is through the help of this water flosser from Dentalski. We are huge fans of these types of machines as they help thoroughly clean the teeth – much better than a regular or electric toothbrush or even a string floss can! It definitely feels like bringing your dentist home with you every single day. What is so great about using this particular unit to help maintain a good oral health? This one comes with a reservoir capacity of up to 120 seconds. It does not sound like much but it actually is, although this one sits right in the middle of our list when it comes to tank capacity. Another reason for considering this particular product is that it has a 360-degree rotatable tip. You can keep the tip inside your mouth so there is less water dripping (and thus less mess) but you can still be assured that you get the maximum coverage when it comes to cleaning your teeth. We also found out that this water flosser from Dentalski provides just the right amount of pressure so that it is comfortable, even though it only has five settings while the others have 10. There are only five tips included in the package but it should be enough to keep your mouth clean and fresh every day. You have to remember to install the jet tips properly and lock it until a click sound is heard. Otherwise, water will drip all over the place – this is probably what happened to the customers who complained about the unit leaking. If you want to change the tips, you can do so by unlocking it through pressing the release button. We love the design of this product but still think that the others in this list are far superior compared to this unit, especially when considering its price point. As such, it will have to stay at the bottom of our list. Now your family is on its way to a much healthier teeth and gums all because of you and your choice to get a water flosser. Not only is it a fun mechanism to play with and add to your daily routine but it is also very effective in getting rid of those plaque and other build up that you cannot remove with brushing or regular dental floss alone. If you have always found flossing a difficult habit to keep up, you might want to consider this. Your dentist will surely praise you and you (and your family) will thank yourself later. Do not forget to instill good oral habits to your family, even as early as the teething stage.